Being a lifelong learner is something that I always promote with my students. But what is it really and how do we teach it? 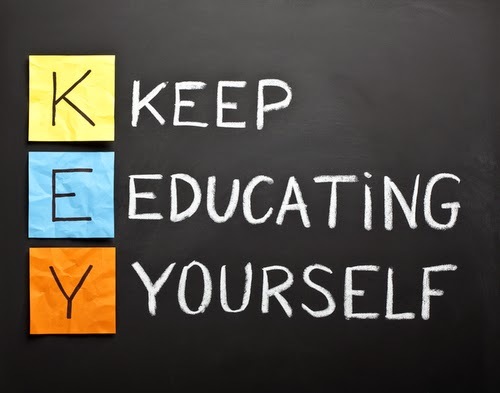 When I ‘Googled’ the phrase “What is a lifelong learner” I found this statement, which I believe is a fair reflection of what a lifelong learner is: “the ongoing, voluntary, and self-motivated pursuit of knowledge for either personal or professional reasons”. How is this definition applied in the real world of education though? The reality is that in my classroom (or the classrooms that I work or observe in) I always give students an example of how learning never stops. I always try to give an example of how I have learnt something or how I have discovered to do something in a different way. What I hope they take away from this is the idea that learning never stops, learning is fun and learning keeps us going. Often, during my weekly mentoring sessions with students, we discuss what they have been learning and their short term, mid term and long term goals. I would like to incorporate more ‘lifelong learning’ discussions with my students and after writing this I will be starting after the break with some deep and meaningful reflective questions. In schools I believe questioning is one of the most important skills that we are not actively teaching well enough (see my previous article). I have found that students who understand how to ask a deeper questioning are better at finding knowledge and therefore find the idea of lifelong learning more ‘manageable’. I believe that schools should be actively teaching students about questioning, learning styles and attitudes towards learning. Currently, what I see in schools is a whole lot of preaching from the front of the room – “Be a lifelong learner” – but in reality educators are just paying lip service to it. My challenge to educators around the world is be proactive and think critically about how you teach students to become lifelong learners, is it something that is teachable or is it just something that occurs? An interesting question for us to reflect on. As an educator, I am a role model. I am someone for my students to look up to and be inspired by. I model lifelong learning, I tell stories, I discuss things I have done, mistakes I have made, give examples of my learning but most importantly, I listen. I listen to what my students say, I give them a voice and let them be heard. I don’t preach from the front of the classroom and tell them what is the ‘right’ way to be a lifelong learner. I give examples and let them make decisions. The ‘KEY’ is to Keep Educating Yourself. I am a lifelong learner and a lifelong educator. How do you define yourself? This is so true Craig! I try to learn every day and what I’ve found is that I learn so much by watching children. You also bring up a great point bout admitting mistakes. Once kids see us do this, they don’t worry as much about making them. Well done! I concur. Humour, critical thinking and admitting fallibility is all part of the mix. Great post! Interesting post. I think that letting students pursue their own passions and interests through inquiry and those deep questions is critical to keep kids engaged. Lifelong learning is great mental floss for all of us. Fantastic reminders Craig. We must remain learned in order to support learning and growth for so many! Thanks Craig for another good read. I am not happy, though, with you choice of illustration. Four pictures indicating that learning equals reading or visa versa. Being a lifelong learning involves much more than reading – which I am aware that you believe just as much as I do. Thank you for this helpful reminder Craig. When interests, passions, and experiences are mixed into the learning salad this is called LIFE-WIDE LEARNING, a lesser known, but equally important as lifelong learning. Why? Because the classroom is shrinking as the beacon of learning. Social networks are forming the foundation of Web 3.0 learning. Self-determined, inquiry-based learning will determine the level of success in this new learning environment. And yes, people of any age will be engaging in these learning networks. This is so insightful! I agree, even in 2017, that in the classroom, we as students are not asking enough questions, and seek mostly answers. Your post is actually a good way to explain the importance of active learning. It’s really great. These ebooks could be categorized in a number of techniques, but classifying these based on excellent studying team is the best method.